“Lor Mee”, or Braised Pork noodle, has a few variants at least from my point of view. There are the “Starchy” ones which add a mushy texture to the braised gravy; Then there are “Fishy” ones which use fried shredded fish meat as the key ingredients to the noodle and the gravy. There are also “Crunchy” types where fried flour-based bits creates crusty texture that contrasts the gooey gravy. Of course, there are those who had a mix of the above. 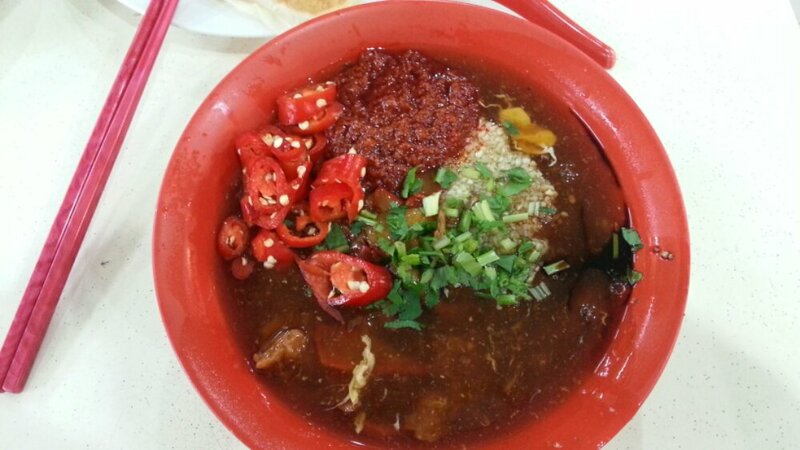 Bukit Purmei Lor mee, uses the “Starchy” and “Crunchy” version. The problem with “starchy” gravy is that some stalls use that to conceal the lack of braised pork belly savoury, as it can be very time consuming to prepare. But not this stall. The gravy remains palatable, and complimented well by the crispy bits. The char-siew and braised pork belly are nothing to shout about, but I suspect foodies go there not for the meat, but for the gooey gravy and crunchy bits layered with vinegar, sambal and cut chillies.